Dark Arts Books is proud to announce we will release our sixth title, When The Night Comes Down in March 2010. The book will debut at the World Horror Convention being held in Brighton, UK, March 25-28 2010. 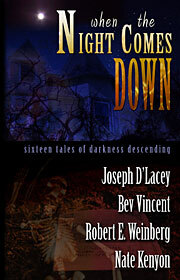 When The Night Comes Down features tales of terror and suspense from four unique and gifted writers: Joseph D’Lacey, Nate Kenyon, Bev Vincent and Robert E. Weinberg. You can find ordering information for the horror/dark fantasy anthology When the Night Comes Down from Dark Arts Books in the Dark Arts Books Store! This entry was posted by admin on Wednesday, January 13th, 2010 at 8:49 pm	and is filed under News, Uncategorized. You can follow any responses to this entry through the RSS 2.0 feed. Responses are currently closed, but you can trackback from your own site.